In a dwindling full-size SUV market, the 2012 Ford Expedition XL, with seating for 5 and 108 cubic feet of cargo capacity, remains one of the more well-endowed choices. Boasting 17-inch alloy wheels, a roof rack, heated power-adjustable mirrors with integrated blind-spot indent and a standard Class IV trailer hitch and wiring, this entry-level trim also comes with cloth upholstery, a power-adjustable driver’s seat, leather-wrapped steering wheel, reclining rear seats and simulated alloy cabin trim. Cruise control, full power accessories and tilt-wheel steering add convenience, while front and rear air conditioning will soothe on long, hot drives. Finally, a 160-watt audio system boasts 6 speakers, an auxiliary MP3 hookup, satellite radio and separate rear-seat controls. Options, meanwhile, include a heavy-duty trailer package, remote engine start, rear-seat DVD entertainment, Ford’s touted SYNC AppLink infotainment system with Bluetooth and a 3.73 non-limited-slip rear axle. Powering the 2012 Expedition XL is a 5.3-liter Flex Fuel V8 with variable valve timing (VVT). Mated with the standard 6-speed transmission, this capable mill pounds out 310 hp and 365 lb-ft of torque, while it’ll get an estimated 14 mpg city/20 highway with the standard rear-wheel drivetrain (RWD). Towing, finally, is maxed out at 9,200 pounds when properly equipped. Noteworthy standard safety equipment aboard Ford’s entry-level full-size Expedition XL includes 4-wheel antilock brakes (ABS), traction and stability control, front side-mounted airbags and front and rear head airbags. This big ute also sports standard front fog/driving lights, a post-collision safety system, remote antitheft alarm and, when sis or junior have high hopes for an evening out, Ford’s programmable MyKey speed and audio limiters. Stepping things up a notch in the 2012 Ford Expedition trim lineup is the well-endowed XLT. This 8-passenger full-size SUV boasts 3 rows of seating and 108 cubic feet of cargo space, not to mention a potent V8 powerplant and rear-wheel-drive (RWD) scoot. Standard exterior bling includes 18-inch alloy wheels, a roof rack, molded side steps, a Class IV trailer hitch and wiring, and heated power-adjustable exterior mirrors, while cloth upholstery, a power-adjustable driver’s seat, leather-wrapped steering wheel and simulated alloy accents adorn the cabin. Cruise control, full power accessories, power-adjustable pedals and tilt-wheel steering are bolstered by a universal remote garage door opener, with front and rear parking sensors helping drivers become instantly expert at parallel parking. Bluetooth/SYNC AppLink infotainment also comes standard in this classy ute, as does a 160-watt stereo that boasts an MP3-capable single-CD player with 6 speakers, satellite radio, a USB port and rear-seat audio controls. Options-wise, the 2012 Expedition XLT can be delivered with remote engine start, rear-seat DVD entertainment, second-row captain’s chairs, a load-leveling rear air suspension, HD radio, upgraded audio, memory for driver's settings and a power moonroof, not to mention leather-trimmed upholstery and a hard-drive-based navigation suite. A power-opening rear liftgate is also available to this lower-midlevel trim, as are heated second-row seats, a heavy-duty towing package and a 3.73 non-limited-slip rear axle. Powering this big ute, meanwhile, is the standard (and only) 5.3-liter Flax Fuel V8 engine that mates with a 6-speed automatic transmission for 310 hp and 365 lb-ft of torque. Look for 9,200 pounds of towing capacity when properly equipped, while variable-valve-timed (VVT) mileage in this rear-wheel-drive-only (RWD) ute is estimated at 14 mpg city/20 highway. Finally, besides sheer heft, this hefty hauler offers such standard safety features as 4-wheel antilock brakes, traction and stability control, front side-mounted airbags, 3-row head airbags, front fog/driving lights, a post-collision safety system and a remote antitheft alarm. Additionally, the 2012 Expedition XLT boasts Ford’s MyKey programmable speed and audio settings, as well as remaining eligible for available rain-sensing wipers and turn-signal-integrated mirrors. Grab hold of Ford’s 2012 Expedition XL 4WD if you need a full-size 5-passenger SUV that’ll go just about anywhere. With standard Control Trac 4WD flaunting lo- and hi-speed gearing, auto-locking hubs and 3 driver-selectable 4-wheel-drive (4WD) modes, this hefty ute is ready for whatever the road or the trail has to offer. Of course, over 108 cubic feet of total cargo space come with this heavy hauler, while 17-inch alloy wheels, a roof rack, side steps, a tow hitch and wiring, and heated power-adjustable mirrors with blind spot indents jazz up the profile. Inside, look for cloth upholstery, a power-adjustable driver’s seat, a leather-wrapped steering wheel and simulated alloy cabin trim, not to mention reclining rear seats, front and rear air conditioning, and full power accessories. Cruise control is also standard, as is tilt-wheel steering, while entertainment is offered via a 160-watt MP3-capable single CD player with 6 speakers, as well as satellite radio and rear audio controls. Of course, the 2012 Expedition XL 4WD remains eligible for such add-ons as available remote engine start, rear-seat DVD entertainment, SYNC AppLink infotainment with Bluetooth, a heavy-duty trailer package and a 3.73 non-limited-slip rear axle. Again for 2012, the ubiquitous 5.3-liter Flex Fuel V8 engine with variable valve timing (VVT) gives this humongous ute its go. Combined with a 6-speed automatic transmission, this 4WD hauler humps 310 hp and 365 lb-ft of torque, has a towing capacity of 9,200 pounds when properly equipped and gets gas mileage estimated at 13 mpg city/18 highway. Besides sheer bulk, standard safety features include 4-wheel antilock brakes (ABS), traction and stability control, front side-mounted airbags and front and rear head airbags. Front fog/driving lights, a post-collision safety system and a remote antitheft alarm are also standard, as is Ford’s touted MyKey programmable speed and audio limiter, which should help keep younger drivers on the right side of the law. Got some extra folks to tote around? Check out the 2012 Ford Expedition EL XL. Boasting 221.3 inches of overall length, 3 rows of seating for up to 8 and almost 131 cubic feet of total cargo room, this is one big full-size SUV. Packed outboard are 17-inch alloy wheels, a roof rack, step running boards, a trailer hitch and wiring, and heated power-adjustable mirrors with integrated blind-spot indents, all standard, while the spacious cabin boasts cloth upholstery, a 6-way power-adjustable driver’s seat, a leather-wrapped steering wheel, simulated alloy accents, full power accessories, reclining second-row seats and air conditioning, front and rear. Cruise control and tilt-wheel steering help comfort the driver, with a 160-watt stereo system powering an MP3-capable single-CD player, 6 speakers, satellite radio and rear sound controls. Workman-like options for the 2012 Expedition EL XL, meantime, include a heavy-duty trailer package and 3.73 non-limited-slip rear axle, while more prosaic add-ons include remote engine start, rear-seat DVD entertainment and Ford’s ballyhooed SYNC AppLink infotainment system. Once again, standard power for this stretched ute comes from a Flex Fuel 5.3-liter V8 engine with variable valve timing (VVT) coupled with the standard 6-speed automatic transmission. This pairing nets 310 hp and 365 lb-ft of torque, with mileage in the rear-wheel-drive-only (RWD) XL EL estimated at 14 mpg city/20 highway. Towing remains maxed out at 9,200 pounds with the proper equipment. Standard safety features aboard this big ute…besides its heft…include 4-wheel antilock brakes (ABS), traction and stability control, front side-mounted airbags and front and 3-row head airbags. Front fog/driving lights, a post-collision safety system and a remote antitheft alarm are complemented by Ford’s net-nanny-style MyKey system, which allows folks to program such things as speed and audio limits into their extra-length Expedition when one of the kids wants to borrow it for the evening. Flaunting an overall length of 221.3 inches (18.5 feet), the stretched-out 2012 Ford Expedition EL XLT boasts 3 rows of seating for 8, 130.8 cubic feet of total cargo area, V8 power and standard rear-wheel drive (RWD) scoot. 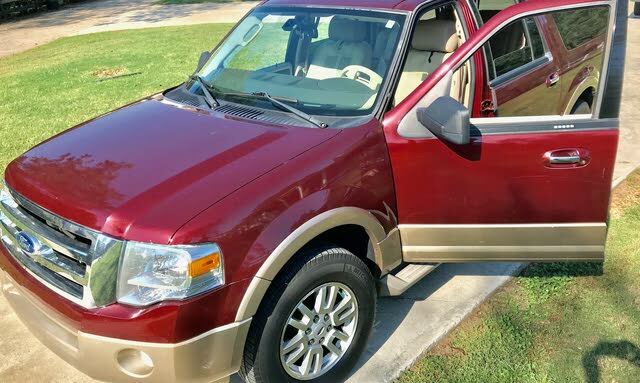 Additionally, look for this full-size SUV to tote standard 18-inch alloy wheels, a roof rack, step running boards, a Class IV towing rig and heated power-adjustable outside mirrors with blind-spot inserts. This midlevel ute’s interior, meantime, sports cloth upholstery, a power-adjustable driver’s seat, reclining rear seats, a leather-wrapped steering wheel and simulated alloy cabin accents. Full power accessories, cruise control, power-adjustable pedals and tilt-wheel steering also remain standard, as do rear parking sensors, a universal remote garage door opener, front and rear air conditioning and Bluetooth/SYNC AppLink infotainment and hands-free communications. Lastly, the 2012 Expedition EL XLT flaunts a 160-watt audio system with an MP3-capable single-CD player, 6 speakers, satellite radio, a USB port and rear-seat audio controls. Of course, this stretched-out ute can be delivered with available heavy-duty trailer-towing equipment and a 3.73 non-limited-slip rear axle, as well as remote engine start, hard-drive-based navigation, a power moonroof and rear-seat DVD entertainment. Then there are such available extras as leather-trimmed upholstery, second row captain’s chairs (7-passenger seating), a power liftgate, HD radio and heated second-row seats. Powering the 2012 Expedition XLT EL is a variable-valve-timed (VVT), Flex Fuel 5.3-liter V8 engine that mates with the standard 6-speed automatic transmission for 310 hp and 365 lb-ft of torque. All this oomph is good to tow 9,200 pounds when properly equipped, with mileage estimated at 14 mpg city/20 highway. Needless to say, size matters, safety-wise, but this hefty hauler nonetheless sports standard 4-wheel antilock brakes, traction and stability control, front side-mounted airbags and 3-row head airbags. Front fog/driving lights remain standard, as do a post-collision safety system, a remote antitheft alarm and Ford’s touted MyKey kid-friendly programmable speed and audio settings. Optional safety features, meanwhile, include rain-sensing wipers and turn-signal-integrated mirrors. With standard Control Trac 4-wheel drive (4WD), the 2012 Ford Expedition XLT 4WD flaunts size, power and go-anywhere capability. This 7-passenger full-size SUV also boasts 3 rows of seating, 108.3 cubic feet of cargo room and V8 power, not to mention standard 18-inch alloy wheels, a roof rack, step running boards, heated power-adjustable outside mirrors and a Class IV towing package. Inside, look for cloth upholstery, a power-adjustable driver’s seat, reclining rear seats, simulated alloy trim accents and a leather-wrapped steering wheel, full power accessories, cruise control, tilt-wheel steering, power-adjustable pedals and SYNC AppLink/Bluetooth infotainment and hands-free communications. Rear parking sensors and a universal remote garage door opener also come standard, as do front and rear air conditioning and a 160-watt, MP3-capable single-CD player with 6 speakers, satellite radio, a USB port and rear-seat audio controls. Options, meanwhile, include a heavy-duty trailer towing package and 3.73 non-limited-slip rear axle, as well as remote engine start, rear-seat DVD entertainment, second-row captain’s chairs (7-passenger capacity), heated second-row seats, upgraded audio components including HD radio and a power moonroof. A power-opening liftgate, hard-drive-based navigation and a load-leveling rear air suspension system can also be delivered with this snazzy ute, with many options coming in either package form or as standalone add-ons. The ubiquitous variable-valve-timed (VVT) 5.3-liter Flex Fuel V8 engine again powers the 2012 Expedition XLT 4WD, combining with the standard 6-speed automatic transmission for 310 hp and 365 lb-ft of torque. Look for 9,200 pounds of maximum trailer-towing capacity with the proper equipment, while 4WD mileage is estimated at 13 mpg city/18 highway. Finally, the on-demand Control Trac 4WD system features electronic hi-lo gear selection, auto-locking hubs and 4 driver-selectable modes for seamless switching between rear-wheel drive (RWD) and 3 modes of 4WD, depending on traction needs. Safety-wise, this big ute’s heft is a major safety factor, yet it still comes with standard 4-wheel antilock braking (ABS), traction and stability control, front side-mounted airbags and 3-row head airbags. Then there are front fog/driving lights, a post-collision safety system and remote antitheft alarm, all bolstered by Ford’s notable MyKey programmable speed and audio limiting feature for a few less worries when the kids borrow the XLT 4WD for the evening. Finally, optional safety features include rain-sensing wipers and turn-signal-integrated mirrors. Stretched out to its full 18.5 feet (221.3 inches), the 2012 Ford Expedition EL XL 4WD adds some 15 inches of overall length to its standard-size compatriots. This full-size SUV, once a prizewinner in Ford’s stable, still boasts 3 rows of seating for up to 8 and almost 131 cubic feet of cargo area. As its moniker implies, this big ute also comes with Ford’s driver-selectable Control Trac 4-wheel drive (4WD) with electronic hi-lo gear selection and auto-locking hubs. This system allows drivers to switch from rear-wheel drive (RWD) to 4WD and back, with the additional capability of shifting to a lower gear when the going gets really tough. A handsome and venerable profile, meantime, boasts 17-inch alloy wheels, step running boards, a roof rack, a Class IV trailer hitch and wiring, and heated power-adjustable outside mirrors with blind-spot indents. Inside, look for cloth upholstery, reclining second-row seats, a leather-wrapped steering wheel and simulated alloy trim. Full power accessories are bolstered by front and rear air conditioning and a 160-watt audio system complete with an MP3-capable single-CD player, 6 speakers, satellite radio and rear controls. Finally, cruise control and tilt-wheel steering give drivers an extra measure of comfort and convenience. Of course the EL XL 4WD remains eligible for some heady options choices, like remote engine start, rear-seat DVD entertainment, a heavy-duty trailer package and a 3.73 non-limited-slip rear axle. And then there’s Ford’s Bluetooth-boosted SYNC AppLinks infotainment package for some added entertainment and communications capabilities. Look for the standard (and only) 5.3-liter Flex Fuel V8 engine to mate with a 6-speed automatic transmission for 310 hp and 365 lb-ft of torque, while variable valve timing (VVT) allows this 4WD monster to get an estimated 13 mpg city/18 highway. Towing, finally, is maxed out at 9,200 pounds with the proper equipment. Safety-wise, besides sheer size, the 2012 Expedition XL EL 4WD boasts such notable features as 4-wheel antilock brakes (ABS), traction and stability control, front side-mounted airbags and 3-row head airbags. Front fog/driving lights, a post-collision safety system and a remote antitheft alarm, along with the touted MyKey speed- and audio-programmable system, help keep owners (and their kids) worrying less about safety and more about gas prices. For when you absolutely, positively have to get a lot of people and stuff there, no matter the weather, check out the 2012 Ford Expedition EL XLT 4WD. This stretched-out (18.5 feet overall) full-size SUV flaunts 3 rows of seating and nearly 131 cubic feet of total cargo area. It also boasts standard Control Trac 4-wheel drive (4WD), with electronic hi-lo gearing, auto-locking hubs and driver-selectable modes for seamless maneuvering between rear-wheel drive (RWD) and 3 different 4WD settings. Outside, this lower-midlevel trim sports 18-inch alloy wheels, a roof rack, step running boards, a Class IV towing package and heated power-adjustable mirrors. Inside, tire-kickers can look for cloth upholstery, a power-adjustable driver’s seat, full power accessories, a leather-wrapped steering wheel, simulated alloy cabin accents and power-adjustable pedals, all complemented by cruise control and tilt-wheel steering. Then there’s a standard universal remote garage door opener, rear parking sensors, front and rear air conditioning and Ford’s ballyhooed SYNC AppLink infotainment and integrated Bluetooth hands-free communications. Entertainment, meantime, is presented via a 160-watt system boasting an MP3-capable single-CD player, 6 speakers, satellite radio, a USB connection and rear audio controls. If desired, the 2012 Expedition XLT EL 4WD can be delivered with remote engine start, a power moonroof and rear-seat DVD entertainment, as well as a heavy-duty trailer hitch and 3.73 non-limited-slip rear axle. Further available add-ons include heated second-row seats, leather-trimmed upholstery and hard-drive-based navigation, as well as HD radio and a power liftgate. The variable-valve-timed (VVT), Flex Fuel 5.3-liter V8 engine remains standard in this heavy hauler, with the 6-speed automatic transmission producing 310 hp and 365 lb-ft of torque. Look for 9,200 pounds of towing capacity with the proper equipment, but this 4WD-equipped behemoth will get mileage estimated at only 13 mpg city/18 highway. Standard safety features aboard the 2012 Expedition XLT EL 4WD, besides sheer bulk, include 4-wheel antilock brakes, traction and stability control, front side-mounted airbags, front and rear head airbags, front fog/driving lights, a post-collision safety system and a remote antitheft alarm. Furthermore, this big ute comes with Ford’s young-driver-oriented MyKey programmable speed and audio settings, as well as offering optional rain-sensing wipers and turn-signal-integrated mirrors. As the next-to-premium trim in Ford’s 2012 Expedition lineup, the Limited comes with a whole lot of state-of-the-art goodies. This full-size SUV starts out flaunting its 108.3 cubic feet of cargo space, seating for 8 in 3 rows, an auxiliary transmission cooler and V8 power. It continues to impress with such exterior features as 18-inch alloy wheels, a roof rack, molded step running boards, a heavy-duty towing package and heated power-adjustable mirrors with new-for 2012 blind-spot indents. Inside, meantime, look for heated power-adjustable front seats, reclining and heated second-row seats, premium leather upholstery, power-adjustable pedals, memory for driver's settings, a leather-wrapped steering wheel and leather, simulated alloy and simulated wood cabin trim accents. Tri-zone climate control is also standard, as are cruise control, tilt-wheel steering, a universal remote garage door opener, full power accessories, Bluetooth/SYNC AppLink infotainment and hands-free communications, front and rear parking sensors, and a rear-view camera. Power-folding third-row seats are complemented by a power-opening liftgate, while entertainment is raised to a whole other level with the standard 340-watt audio system with an MP3-capable single-CD player, 7 speakers, satellite radio, iPod integration, rear-seat audio controls and a USB port. This big ute can also be delivered with extras like available remote engine start, rear-seat DVD entertainment, hard-drive-based navigation, a power moonroof, second-row captain’s chairs (7 passengers), HD radio, an auto-leveling rear suspension and a 3.73 non-limited-slip rear axle. Powering the rear-wheel-drive-only (RWD) 2012 Expedition Limited is a variable-valve-timed (VVT) Flex Fuel 5.3-liter V8 engine that mates with a 6-speed automatic transmission for 310 hp and 365 lb-ft of torque. Towing is maxed out at 9,200 pounds with the proper equipment, while mileage is estimated at 14 mpg city/20 highway. Notable standard safety features aboard this penultimate Expedition trim include, besides sheer size, 4-wheel antilock brakes (ABS), traction and stability control, front side-mounted airbags and 3-row head airbags. Front fog/driving lights also come standard, as do turn-signal-integrated mirrors, rain-sensing wipers, a post-collision safety system and a remote antitheft alarm. Finally, Ford’s touted MyKey programmable speed and audio settings are a further standard safety feature across the Expedition lineup. As the flagship of the 2012 Ford Expedition fleet, the King Ranch offers near Lincoln-esque appointments at a more down-to-earth price. This full-size SUV flaunts seating for 8 in 3 rows and just over 108 cubic feet of cargo capacity, not to mention standard torque-toting rear-wheel-drive (RWD). Outside, expect 18-inch alloy wheels, a power-opening rear liftgate, a roof rack with side rails, molded step running boards, a heavy-duty towing package and heated power-adjustable mirrors. Inside, look for upgraded premium leather upholstery, heated power-adjustable front seats, heated and reclining second-row seats, power-folding third-row seatbacks, a leather-wrapped steering wheel and leather, simulated wood and simulated alloy interior trim accents. Cruise control, tilt-wheel steering, power-adjustable pedals, full power accessories and driver's memory settings all come standard on this high-end ute, as does a universal remote garage door opener, front and rear parking sensors and a rear-view camera. All of this is, of course, embraced by tri-zone climate control, as is the standard Bluetooth/SYNC AppLink infotainment and hands-free communication technology. Entertainment, finally, is presented via a 340-watt system that sports an MP3-capable single-CD player, 7 speakers, satellite radio, a USB port and separate rear-seat audio controls. Believe it or not, this loaded-up ute offers such options as remote engine start, a power moonroof, hard-drive-based navigation, second-row captain’s chairs (for 7-passenger capacity), rear-seat DVD entertainment, HD radio, an auto-leveling rear suspension and/or a 3.73 non-limited-slip rear axle for those extra-tough towing jobs. Like its lesser siblings, the 2012 King Ranch sports a Flex Fuel 5.3-liter V8 powerplant that boasts variable valve timing (VVT), 310 hp and 365 lb-ft of torque. Under the management of its 6-speed automatic transmission, this big ute will tow some 9,200 pounds when properly equipped, with mileage estimated at 14 mpg city/20 highway. The more notable standard safety features, meantime, remain 4-wheel antilock brakes (ABS), traction and stability control, front side-mounted airbags and 3-row head airbags. Front fog/driving lights and turn-signal-integrated mirrors, of course, remain standard safety equipment, as do a post-collision safety system, rain-sensing wipers and a remote antitheft alarm. Finally, as with all its Expedition kinfolk, the King Ranch carries Ford’s MyKey programmable speed and audio settings, ensuring a little less tossing and turning when the kids borrow the ute for an evening. Sporting a length of just over 18.5 feet, the 3-row, 8-passenger 2012 Ford Expedition EL Limited full-size SUV flaunts nearly 131 cubic feet of total cargo space. This second-highest trim also enhances its profile with 18-inch alloy wheels, a roof rack, molded step running boards, a heavy-duty towing package and heated power-adjustable mirrors with new blind-spot indents. Inside, look for premium leather upholstery, heated power-adjustable front seats, reclining and heated second-row seats, a leather-wrapped steering wheel and leather, simulated alloy and simulated wood cabin accents. Further quasi-luxury touches include full power accessories, power-adjustable pedals, front and rear parking sensors, a rear-view camera, tri-zone climate control, a universal remote garage door opener, memory for driver's settings, cruise control and tilt-wheel steering, with power-folding third-row seatbacks complementing a power-opening rear liftgate. Standard techno-bling includes Ford’s famous SYNC AppLink infotainment with Bluetooth hands-free calling, as well as a 340-watt stereo boasting an MP3-capable single-CD player, 7 speakers, satellite radio, a USB connection and rear-seat audio controls. For 2012, the Expedition Limited 4WD can be delivered with available remote engine start, rear-seat DVD entertainment, HD radio, a power moonroof, hard-drive-based navigation and second-row captain’s chairs that, alas, reduce seating capacity to 7. A 3.73 non-limited-slip rear axle and/or an auto-leveling rear suspension can also be delivered with this trailer-toting ute. Standard power for the Expedition EL Limited is a Flex Fuel 5.3-liter V8 engine with variable valve timing (VVT). Mated with the standard 6-speed automatic transmission (with standard auxiliary transmission cooling), this big ute is endowed with 310 hp and 365 lb-ft of torque, tows up to 9,200 pounds when properly equipped and with standard rear-wheel drive (RWD), is estimated at 14 mpg city/20 highway. Finally, standard safety features include, besides sheer size, 4-wheel antilock brakes, traction and stability control, front side-mounted airbags and 3-row head airbags. Further, standard front fog/driving lights, turn-signal-integrated mirrors, rain-sensing wipers, a post-collision safety system and remote antitheft alarm are bolstered by Ford’s young-driver-geared programmable MyKey speed and audio limiters. Need a high-end full-size SUV for hauling people and stuff? Ford’s full-size 2012 Expedition Limited SUV offers a ton of features, plus 108 cubic feet of cargo area, 3-row seating for 8, an auxiliary transmission cooler, V8 power and, of course, Ford’s Control Trac 4-wheel drive (4WD) system. Adorning the outside of this upper-echelon ute are standard 18-inch alloy wheels, a roof rack, molded step running boards, a heavy-duty towing package and heated power-adjustable mirrors with just-added blind-spot indents. The cabin, meanwhile, is packed with leather upholstery, heated power-adjustable front seats, heated, reclining second-row seats, leather, full power accessories, simulated alloy and simulated wood accents and a leather-wrapped steering wheel. Then there’s standard cruise control, tilt-wheel steering, memory for driver's settings, power-adjustable pedals, front and rear parking sensors, a rear-view camera, universal remote garage door opener and tri-zone climate control. A power-folding third-row seat, finally, is complemented by a power-opening rear liftgate. Techno-goodies include Bluetooth/SYNC AppLink infotainment and hands-free calling, 340 watts of audio power, an MP3-capable single-CD player, 7 speakers, satellite radio, iPod integration, a USB connection and rear-seat audio controls. Options-wise, remote engine start, a power moonroof, rear-seat DVD entertainment, a 3.73 non-limited-slip rear axle, HD radio, second-row captain’s chairs (7-passenger capacity), auto-leveling rear suspension and a hard-drive-based navigation suite are all available in this penultimate trim. The ubiquitous Flex Fuel 5.3-liter V8 powerplant, with variable valve timing (VVT), gives the 2012 Expedition Limited 4WD its go. Managed by the standard 6-speed automatic transmission, this potent V8 puts out 310 hp and 365 lb-ft of torque, good enough to tow up to 9,200 pounds with the proper equipment. Mileage is estimated at 13 mpg city/18 highway, while the standard 4WD system offers electronic hi-lo gear selection, auto-locking hubs and 3 driver-selectable 4WD settings. Relying more than a little on sheer bulk for safety, the 2012 Limited 4WD nevertheless comes with 4-wheel antilock braking (ABS), traction and stability control, front side-mounted airbags and 3-row head airbags. Also look for standard front fog/driving lights, turn-signal-integrated mirrors, rain-sensing wipers, a post-collision safety system, Ford’s MyKey programmable speed and audio settings, and a remote antitheft alarm.